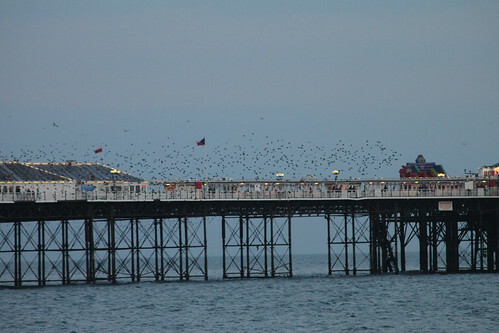 Thousands of starlings flock - I think that's the word - to Brighton Pier as the sun sets on early spring evenings, and put on a display of swooping and swirling, backing and forthing, joining up and separating. They even momentarily disappear from sight, low over the waves - see #17, taken only 5 seconds after #16; 14 seconds later they're rising again and can be seen against the sky. Now you see them, now you don't. Just like that. 18:06 - 18:15 - 9 minutes.